Erynn and I moved to Bristol, England on Novemeber 29, 2000. I was granted residence based on a work visa, and Erynn resides on a dependent visa (multiple entry clearance). 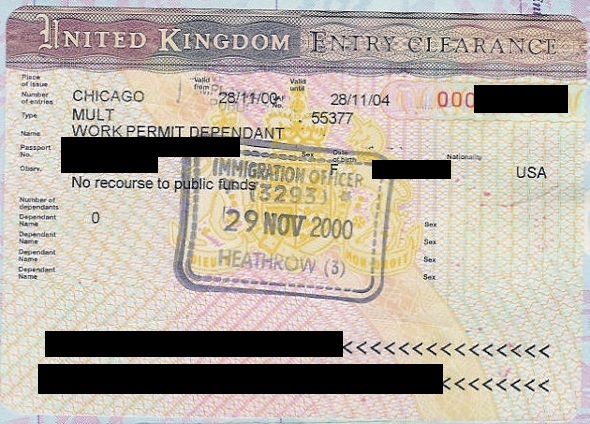 We moved back to the US in April 2003. Doug's Leave to Enter Stamp and corresponding entry stamp into Heathrow. The UK does not stamp your passport upon exit from the country. 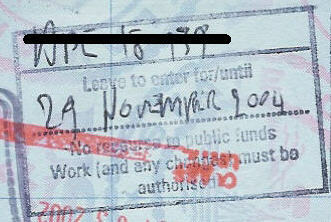 Also, once you're granted leave to enter, the immagration officials are not supposed to stamp your passport anymore. This explains the relative lack of UK stamps in my passport even though we've done almost all of our European travel while living in the UK (between 2001 & 2003). If you notice though they did stamp my passport in Bristol once when they shouldn't have. All other UK stamps on this page were from trips outside of our residency period. We officially terminated our UK residence on April 2, 2003 when we arrived in Prague. My company moved us back to the US and before went home we decided to take one last trip. From the day we originally arrived in the UK I wanted to travel around Central Europe to Prague, Vienna, and Budapest. From Budapest we stopped over in London for an evening before travelling on to the US. 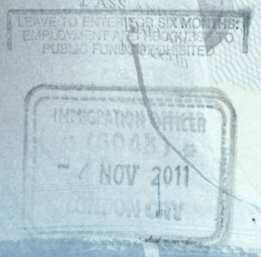 Since we were no longer resident in the UK, the immigration people stamped our passports, which is shown below. 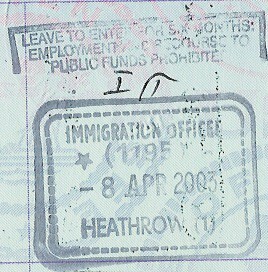 Entry stamp to Heathrow (London): April 8, 2003. 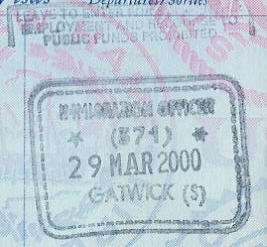 Entry stamp to Gatwick (London): March 29, 2000. 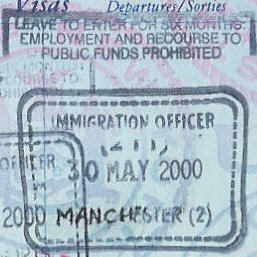 Entry stamp to Manchester: May 30, 2000. 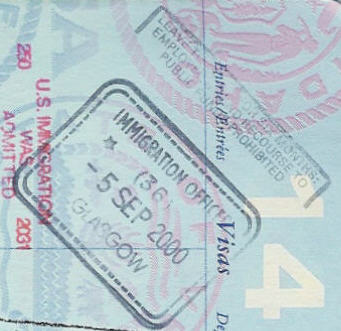 Entry stamp to Glasgow: September 5, 2000. 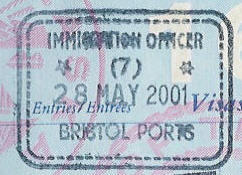 Entry stamp to Bristol: May 28, 2001. 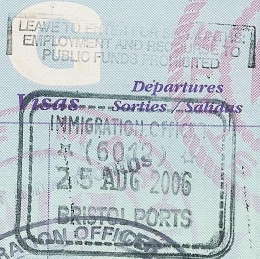 Entry stamp to Bristol: August 25, 2006. 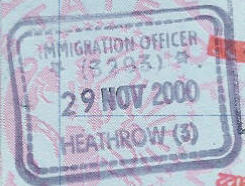 Entry stamp to London City Airport: November 4, 2011. 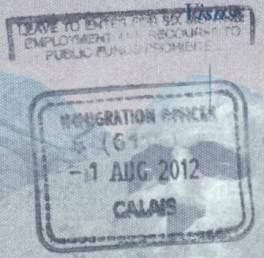 Entry stamp to Calais by ferry: August 1, 2012. We cleared UK immigration right in the Port of Calais on French soil. Before driving onto the ferry you go to a booth housing the French immigration official to get the exit stamp. Then you drive 5 feet to the UK booth to get your entry stamp. Very efficient and two stamps in 5 minutes! © 2002-2016 Doug Rathburn. All rights reserved.